I’ve created a page for keeping track of all the miniatures I have painted, plus what I’ve bought, prepped etc. Hopefully, this will help me not duplicate purchases, and inspire me to keep things moving through the pipeline. Every time I finish a miniature I’ll update this page. I’ll keep the blog posts for when I finish a unit, or reach some other significant milestone. This tutorial was originally written by me for The Leaf on Asrai.org, but I’ve reproduced it here as a starting point for my new blog. 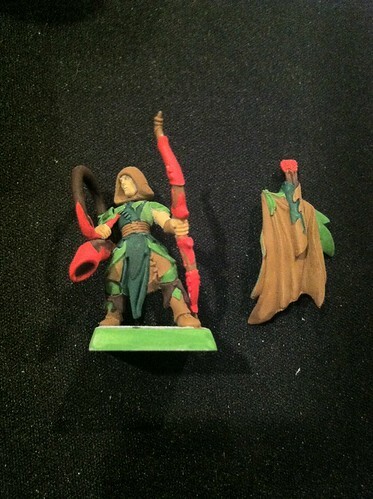 The main core unit that seems to be used in every Wood Elf army list is the Glade Guard, and about a third of that model’s visible surface is the cloak. 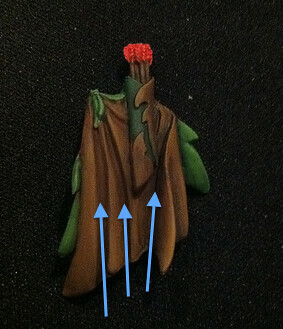 I’ll be using a Glade Guard cloak for the photos and painting it to look like leather, but this same technique can be used for any type of cloak or folded cloth, and virtually any color scheme. I assume that you are starting with a prepared and primed cloak. You may not want to go to this level of detail for every miniature, but the painting is the relaxing and creative part of the hobby for me. 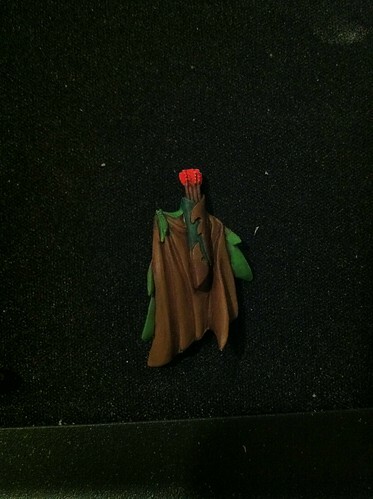 Painting a cloak like this will probably take 2-3 hours once you’ve practiced it. 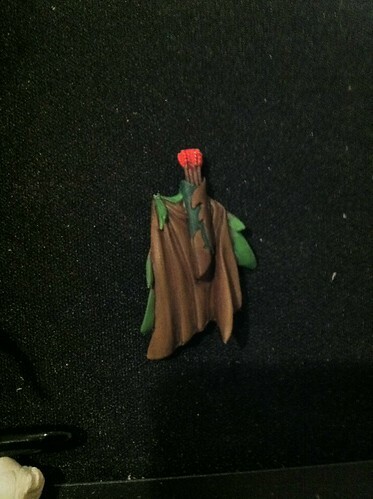 (In the example, I also base-coated and shaded the musician and it took me 4 hours – I estimate 50-75% of that time was on the cloak). 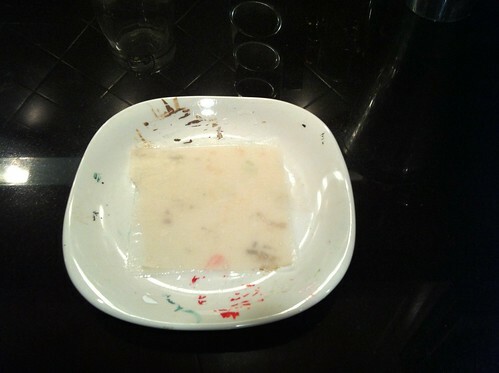 This technique works best with a wet palette. If you don’t know what that is, take a look at this excellent article. It will make you a better painter. First paint a base coat on your miniature. I’ve used Privateer Press’ Bootstrap Leather, but that’s only because it was what was available from my local game store. 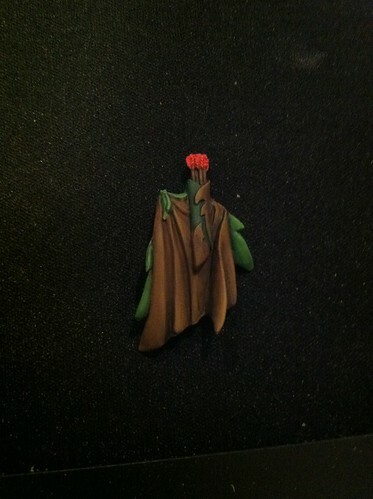 Here’s the miniature, with the cloak beside it (yes, I paint the cloaks separately). 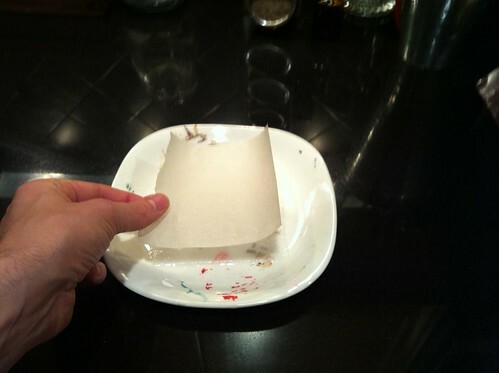 Make sure you thin the paint at roughly 50/50 with water. 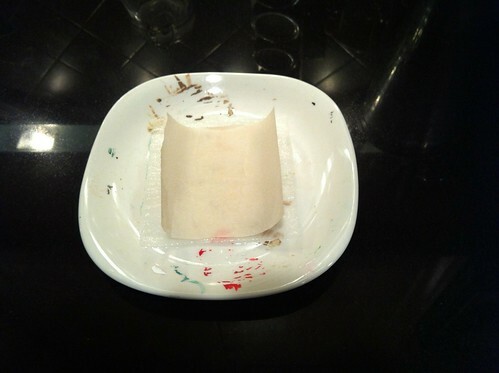 The paint should be thick enough just to cover the white primer with one brush stroke, and no more. 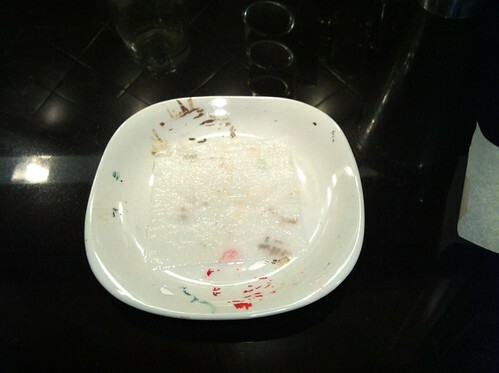 Mix some darker brown with a roughly 1:3 or 1:4 ratio with water. In this case, I’ve used Rhinox Hide from Citadel. There should be enough liquid that it flows into the cracks, but not so much that it forms in pools. 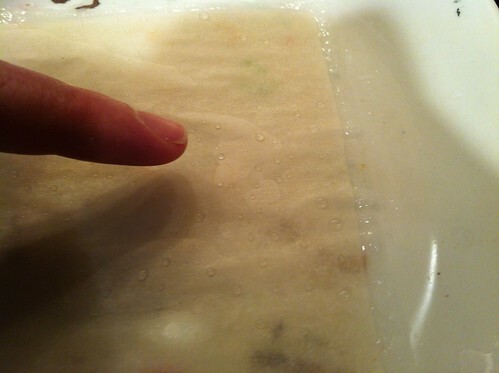 If you make a pool, dry your brush on a paper towel and then absorb the pool with the brush. Cover the whole cloak. 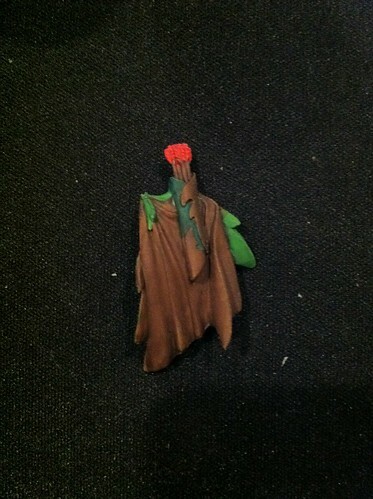 You can see I’ve accidentally painted a part on the cloak brown that should be green – don’t worry, I fix that up shortly. Note that in the image, the deeper crevices look darker and the most raised parts are lighter, which is exactly what you’re looking for. Go back to your original leather color, with the same mix (if you’ve got a wet palette, you’ll just be able to use what you already mixed) and paint over all the raised surfaces. This brings the leather color back, but leaves you with some depth in the crevices. Also, because your wash from above is thin and your paint here is reasonably thin, you’ll get a nice blending without having to wet-blend. (And look, I noticed my mistake and painted the left edges green). Mix your original leather color with some white, keeping it nice and thin – usually at a 1:1 mix with water, maybe a little thinner depending on your white (some whites are quite thick). 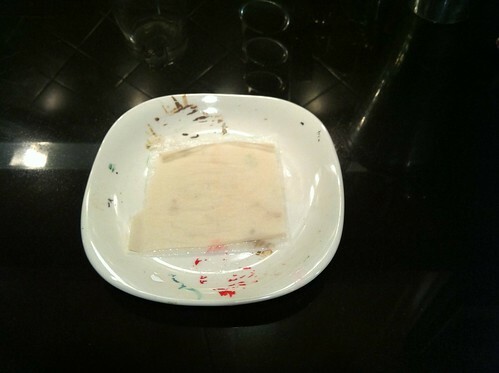 Your actual mix may be 1 part leather, 1 part white, 2 to 3 parts water. 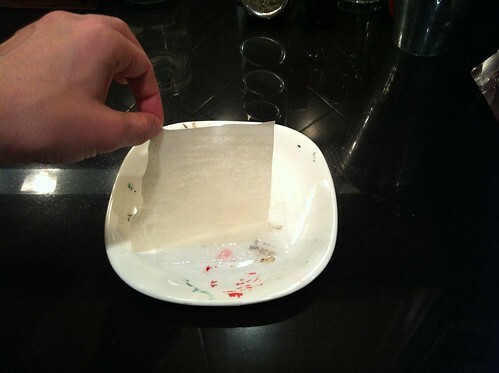 Put some of this paint on your brush and let your brush rest on the paper towel so that the excess flows off and is absorbed. This stage is going to use a pretty light touch. Take the side of your brush point (not the tip) and run it along the ridges. 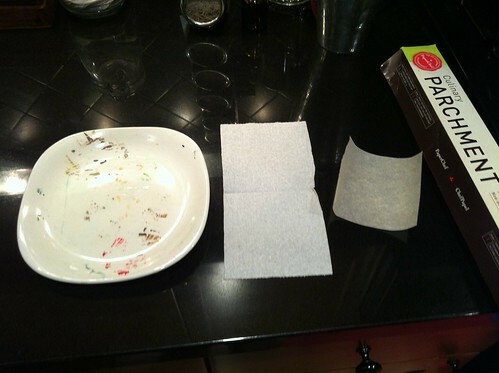 In particular, you want to focus on those areas that stick up a lot or are very straight edged. I’ve put some arrows on this one so you can see what I’m talking about. The trick here is to mimic the areas that are really going to catch the light and those are the stiff folds and very high areas. And here it is without the arrows. This is the final stage and for me it’s what makes a good cloak look great. Take some black, and really thin it down to the point where it’s almost like dirty water. I’d estimate that to be something along the lines of 1:8 ratio. 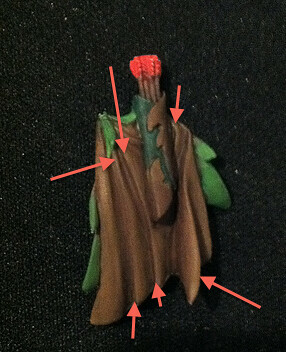 You then paint that into the deepest areas of the cloak – you can see I’ve indicated those with the blue arrows. As you can see in the final thing, this gives a three-dimensional richness. You can paint along those lines several times with your “dirty water” mix until you’re happy with the depth – for the rightmost crevice here, I probably painted it four or five times. Here’s a key point – if you find that you’ve painted a line with your black, or that the paint has dried in a line, you can easily just take some of your original (stage 1) leather paint and paint over the line with it. Just take care not to paint over your highlights or down into your crevice or you’ll have to do it all again. 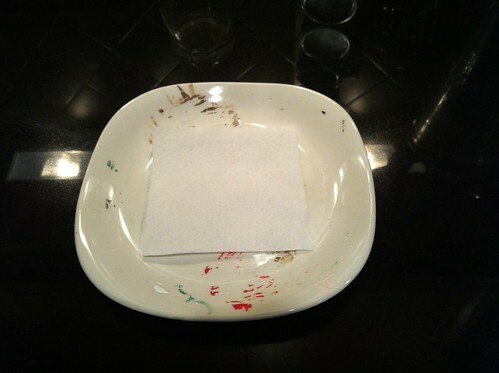 Once you’ve done that, you can just put your very thin black over it again and it will blend nicely as show. And that’s it! Hope you found this helpful.